Remember the crooked man that walked a crooked mile and lived in a crooked house? How about the cartoons full of funky houses with off-kilter windows? 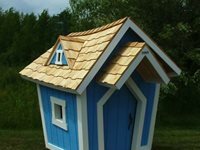 While you may not want to have a crooked house as your primary residence, your kids will likely have lots of fun in their own crooked playhouse. These custom wooden swings are durable and strong. They come in many different shapes and sizes and can be customized with paint, fun designs and names. If you are looking for a unique playground option this may be the answer for you. 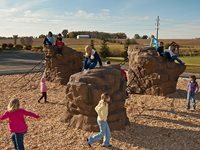 These nature-inspired structures, which replicate trees, climbing boulders, giant mushrooms and more, provide the perfect opportunity for creative outdoor play.